It's official! 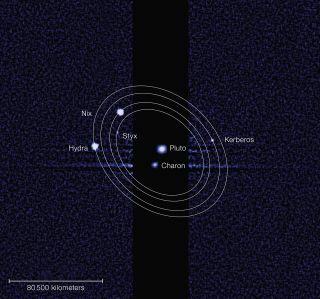 Two tiny moons orbiting the dwarf planet Pluto finally have new names: Styx and Kerberos. The International Astronomical Union — the organization responsible for naming celestial objects — has approved "Kerberos" and "Styx" as the new monikers for two of Pluto's moons that were previously called P4 and P5 respectively, but fans of TV's "Star Trek" might not be too happy about the new names. Actor William Shatner — who portrayed the Starship Enterprise captain James T. Kirk in the original "Star Trek" TV series — suggested Vulcan (the home planet of the show's pointy-eared Vulcan people) as a possible candidate, and voters overwhelmingly cast their ballots in favor of it. In total, nearly 500,000 votes were cast, with about 170,000 of those going to Vulcan alone. In second place was Cerberus with Styx coming in third in the online poll. But for Vulcan, it was not meant to be. "The IAU gave serious consideration to this name, which happens to be shared by the Roman god of volcanoes," SETI officials wrote in a statement. "However, because that name has already been used in astronomy, and because the Roman god is not closely associated with Pluto, this proposal was rejected." IAU rules states that Pluto's moons should be named for mythological characters of the underworld in Greek and Roman mythology. Pluto is known as the ruler of the underworld in ancient mythos. Cerberus, the three-headed dog in Roman mythology, came in a clear second in the Pluto Rocks ballot with nearly 100,000 votes, but IAU officials decided to tweak the name slightly, instead opting to name the moon Kerberos — Cerberus' equivalent in Greek myth. The name Styx, the river that separates the living from the dead in ancient myth, garnered about 88,000 votes for a third place finish. Scientists used the Hubble Space Telescope to discover Styx around Pluto in 2012. The space telescope also helped researchers discover the existence of Kerberos in 2011. Both moons are about 15 to 20 miles (20 to 30 kilometers) in diameter. In all, five moons are known to be orbiting Pluto. Charon, the largest moon, was first spotted in 1978. Two more moons, Nix and Hydra, were discovered by Hubble in 2005. Scientists will get a close-up view of the two new moons and the rest of the Pluto system in 2015 when NASA's New Horizons spacecraft flies by. Bound for Pluto, the probe, launched in 2007, will search for additional moons that Hubble is unable to detect and travel to the Kuiper Belt, a mass of icy bodies left over from the early formation of the solar system. Editor's Note: This story was updated at 12:25 p.m. EDT (1625 GMT) to correct an error. NASA's New Horizons spacecraft was launched in 2006 and will fly by the Pluto system in 2015.